I was having a very busy week last week. With 4 days of training session, I couldn't spend as much time as I want on my hobby. Nonetheless, managed to get something done during the weekend. I have always wanted a means to show my callsign at several ham meetings. Originally I thought of using something similar to a name tag or tie clip. 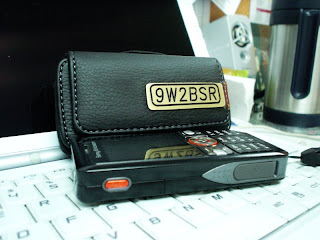 Then I realise that I carry my mobile phone everywhere I go thus a callsign plate on my mobile phone pouch would fit the bill.